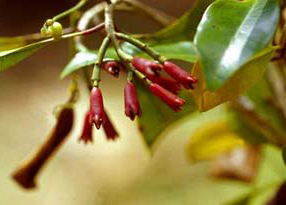 The clove flower bud is most certainly a smell of Christmas with its energising and warming aromas. Mulled wine, gravy spice, candle essence - it's a wonderful multi-use ingredient for all things festive. 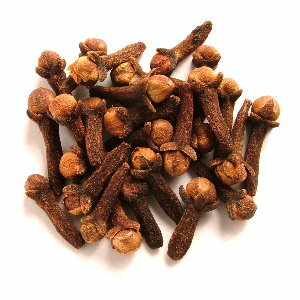 Cloves are native to Indonesia where 80% of clove trees (of the tree family Myrtaceae) are harvested. If you have ever visited Indonesia have surely smelt clove wafting through the air which is mostly due to the special clove or kretek cigarettes smoked there. The word clove however comes from the French word clou, which means nail, for its resemblance to the domestic size fasteners. Though grown predominantly in Indonesia clove is somewhat of a global spice, used for incense in Japan, to flavour rice in India, added to other spices in Mexico, mixed with cardamoms for tea in Europe and used as a painkiller in Chinese medicine. Another of nature's healing gifts, cloves can be used topically as an essential oil to the stomach or ingested when infused as tea to ease digestive problems. It can have a similar warming affect on the spleen and kidneys and has been used to settle morning sickness and diarrhoea. Clove can be found in many natural skin products as it works well to reduce skin sensitivity. Applied in diluted form as an oil or moisturiser, the healing properties of clove can also help acne, severe burns and skin irritations. It is also used to ease dental pain. Pregnant women and small children should avoid in large quantities as it is a powerful spice and can lead to changes in liver function, dyspnoea and hallucination.